The defiling act, blue in color. Ellen Reid has an unusual knack for drawing the colors of emotion from an orchestral ensemble and the human voice. Aware of this talent, the composer chooses to present a story with an emotional rather than a narrative arc. In Prism, we are drawn into a mother-daughter world in which comments are also made by the chorus (The Choir of Trinity Church), an unseen character. We are introduced to the mother Lumee (Rebecca Jo Loeb) and daughter Bibi (Anna Schubert) in an idealized world. Loeb is a superb mezzo, whose voice is full of color and dramatic presence. Schubert's soprano is softly lyric and moves from innocence to devastation with an actor's ease. The setting is an open space which immediately intrigues. 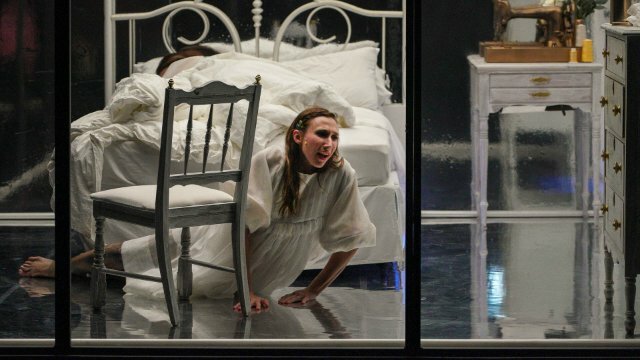 Are we looking at a space that is closed off and contained by glass, like the Park Avenue Armory's Yerma production? 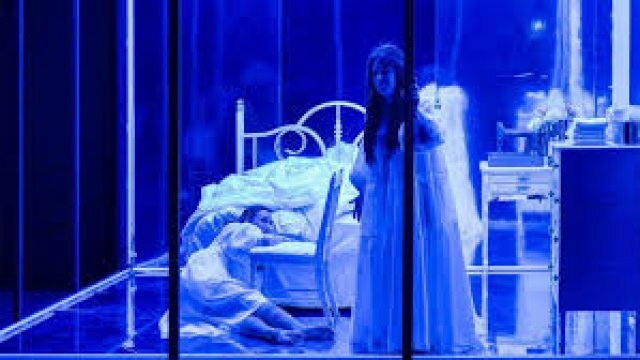 Only when the ideal Sanctuary of Act I has us in its thrall do we realize, as the hem of Lumee's dress drifts beyond the room's frame, that there are no panes in the windows. This is naked space. Like a room in which Will Traynor commits suicide in the film Me Before You, the orderly white space has an ominous pall, stirring fear in Lumee and Bibi and in the audience. The brilliant director James Darrah (Flight, Breaking the Waves, Proving Up) instructed Schubert to forget her legs. From her waist down she is numb. This gives us an image of sexual assault rather than a statement of fact. The precipitating event is choreographed. As Schubert tries to leave the room, in which four dead bolt locks are lined up on the door, we panic. She falls from her bed and drags her body across the floor. She cannot get out. We don't want her to try...yet. Acts II and III take place in a disco club. Sixteen disco lights hang from the ceiling on strings and hover like drones about a foot off the floor. We can barely see the bedroom, which is tucked into the rear of the set. 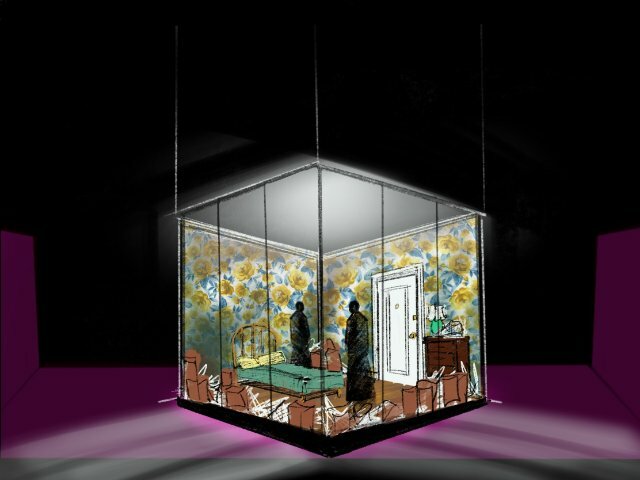 Its wallpaper is visible, flowers even larger than those on the walls of Willy Decker's Traviata, Act II, but more bold. The room is a mess. It is in darkness as the disco events unfold. Lumee is tarted up like a street walker. Bibi retains her innocence even as she strips. The action of Act II begins in the lobby during intermission. Bibi is hoisted on high by four dancers, whose heads are always bent forward in guilt. We the audience follow her back into the theater. Everyone is miked in the performance. "After all," says Reid, "this is 2019." A wonderful electronic pad is struck to offer deeply resonant punctuation marks. Laura Weiner on the French horn bellows out tuba-like bottom notes full of terror. Flute, clarinet and Yamaha piano are all singled out and create a deeply disturbing texture. No spoiler here for the opera's conclusion. It is evocative. In spite of the horrors expressed in its sound world, the opera is inviting. You feel the consequences of sexual assault as they ripple out in one woman's life. Brett Kavanaugh might well take Antonin Scalia's seat in the opera house and learn something in this heart-wrenching work.